How have you experienced diversity throughout your life? I grew up very sheltered. I saw very little in my younger years. I am not upset about this. That is what happens when you come from a small town of only 7,000 people. I wouldn’t trade my childhood for anything. I lived in the All-American neighborhood and was lucky enough to live in a place where we could run around our streets from morning to night without the worry of being snatched up. I had friends everywhere I looked that lived on my street and on neighboring streets. We would ride our bikes for hours (if only I had that same kind of motivation and energy now..haha). I was protected by my parents because they knew very little outside of the small town we came from. My parents are smart people (especially my dad because he follows politics and national/international events) but they have never really lived outside of this small place we called home for a majority of their lives. So, they taught me what they knew and they always wanted to protect me from hardships and from getting hurt. I appreciate this now that I am older but it drove me crazy while growing up. My parents moved down to Myrtle Beach in 2001 and I remained in NY. I came to visit for about 3 weeks and after that I was sold. I decided it was my time to move and to start fresh somewhere else…so why not cross the Mason Dixon line into the deep south and check out an entire different kind of living. Ten years later I still experience culture shock. Diversity is one of those things in which so many people think it only has to do with race or culture. Diversity is SO much more than that. Diversity is something that is occurring in every moment of everyday. 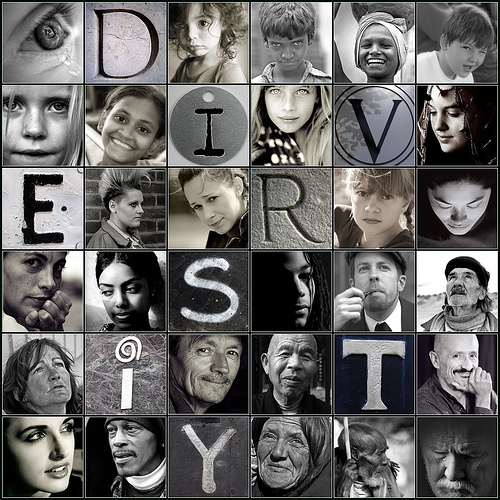 Diversity is our differences….the things/qualities/aspects that make us unique individuals. No two people are exactly alike. It took me a long time to learn and experience true diversity. It was something that was happening around me all of my life and I had been taking it for granted instead of embracing it. When I moved down to the South I found pieces of diversity that I absolutely loved. I loved the southern hospitality and the southern manners (yes ma’am, no sir). I loved the value that family held here (not that they don’t exist up north…you just find it to be different when you move from one area to another). I struggled (and still do) with certain things as well. The pace is much slower down here than what I had ever been used to. For a very long time I viewed this as a negative thing and just pointed fingers and claimed everyone was just lazy. In some cases people were lazy but in others, people were just trying to savor the moment. I have learned a great deal from people and why they do as they do by asking questions. I am a HUGE fan of Eckhart Tolle and The Power of Now is in my top 3 of favorite books and the entire premise is based on embracing the moment and living in the now. How could I be criticizing people for doing that…I guess it was because it was something I was never used to. I was (and I am still working on it) always going and going and going and I was focusing on the future and what needed to be done that I was missing out on enjoying the present moment. I see diversity in who I was and who I am now because I am no longer the same. I think differently and my beliefs have changed. The whole concept of diversity is exciting to me. There is so much to learn and to see and to embrace. It used to drive me crazy to work at different places that would supposedly focus on diversity and having a diverse staff and when asked what makes the staff diverse I would hear, “Well we have whites, blacks, and Hispanics.” I just shook my head and walked the other way. A staff could be made up entirely of all white women and still be one of the most diverse staffs you could come by. Every person has a story and every person has had different experiences. We all learn differently and view the world differently….isn’t that what true diversity is? It is the ability to bring our difference together and use them for good as opposed to evil. Unfortunately our differences do stem a lot of evil in this world….people are still hung up on the difference in skin colors, religions and genders (as well as much more). Diversity (in my opinion) is something to embrace. Since moving to the south (to a MUCH bigger area) I have been exposed to people and places I never thought I would. I grew up in a middle class family and since I have moved I have worked with teenage mothers and done home visits in houses that should have been condemned. I have met folks from all over the country (hell all over the world) that have traveled to the beach to either vacation or to make it their residence. Can you imagine what there is to learn from these people? I have always had a low boredom threshold. Therefore, instead of having a few interests, I always had hundreds. I could never focus on one profession, so I’ve had 20. I’ve met different kinds of people and been in different kinds of work and life environments through each of them. I’m never as excited as when I become interested in something I never knew about before. I’m nearly 60. I doubt my love of diversity will change. I’m glad you’re excited about it too. Wise :).. It is a special thing to see with such clarity 🙂 great blog!!!! It takes a special person to see with such clarity. Beautiful blog!!! I am a knowledge “hog”. Especially when it comes to meeting and learning about new people. In 2002, I traveled to Ireland and had a blast! I love a country that can be simultaneously tech savvy AND “ol’ timey” agricultural. I understand why parents “shelter” their children, however when they get older I find it’s very important for pre-teens and teens to start to learn globally. I hope to purchase Rosetta Stone soon so I can start to learn different languages. I am wondering where you launched off with your questions, and do you have a list you are working through? I am on a blog-a-day challenge but finding motivation for my writing to be a struggle. If you want “diversity”, come visit me in Mounty County (Mount Druitt, Western Sydney, Australia). We have it in spades. Interesting post… This subject makes me ponder often. Sometimes I think I must have grown up in some sort of twilight zone utopia, because I meet so many people who comment that their childhood schools (and therefore they) had no experience of other races, for one. Other Americans, and Canadians. They talk about it like they never met a black person or Asian until college. Like it was a big deal. I didn’t grow up on cosmopolitan NYC or LA, quite far from that Middle average america, and yet from kindergarten my schools had black, Asian, international student, of every possible clique. I essentially grew pump colorblind, in a notoriously conservative state where I still rarely if ever was exposed to bigotry or cultural/religious fear mongering. My sibs and I somehow grew up without our parents or one neighbors prejudices, and without that sense of “you’re different and therefore unacceptable or weird”. Twenty years ago in the mid west our mayor was black and so was our prom queen, in a mostly white school. Every single class had Hispanic, Asian, African American and Caucasian kids. It was just NORMAL. But from what most people I talk to say, this isn’t the norm. Or, maybe, just maybe, they saw things through the filter of their parents eyes, and not their own. I think we kids had the blessing of being left to our own devices to decide how we felt about the world. Sorry to focus on race, I think I was generalizing too much. We grew up with all kinds of music, cultural input, social styles. It just baffles me how many I talk to didn’t. How is that possible?